As part of our Picture Book Month celebration, Jen challenged me to read 15 of her favorite picture books and then review them for you all. Last week, I reviewed the first 5 books and I truly enjoyed them all. This week I'll review the next 5 which includes my favorite so far. Summary: Jacques Cousteau was a sickly young boy who found strength in the sea and he never wanted to leave it. 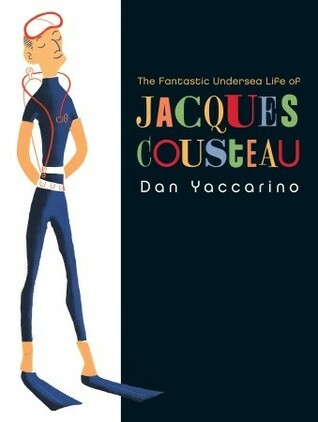 It was Jacques goal in life to learn as much as he could about the wonderful undersea world. What I Think:I had no idea! I've heard Jacques Cousteau's name my whole life, but never really learned who he was or what he did. Wow! He is someone that should be celebrated by all! I am in awe of the man that I just learned about. As for the book, it is equally as impressive. The illustrations are colorful, eye catching and full of magic. I loved how the book was set up, showing not only Jacques life, but the importance of oceanic life and protection through the story and quotes. Truly fascinating! Title: Can we Save the Tiger? Summary: Humans are destroying the Earth at an incredible rate and probably don't realize the destruction that this is causing on the animal population. This book shares with the reader endangered animals that may not exist for that much longer if we do not change how we treat the Earth. What I Think: There is something powerful at work in this book. It's format, it's facts, it's prose, and it's illustrations just all work together so perfectly and there is a perfect balance of each. If you read my Picture Book Month intro, you know that I use The Lorax to teach students about pollution and trying to change how we treat this planet; Can we Save the Tiger? would be a perfect addition to Earth Day because it shows how our treatment of the planet isn't only affecting us. This book will definitely start a conversation- are we willing to do what is needed to help save not only the tiger, but other species and even the whole planet? 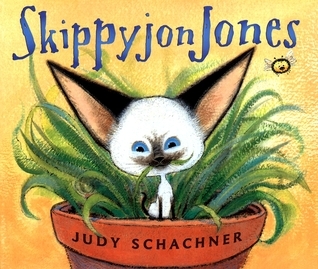 Summary: Skippyjon Jones is a Siamese cat, but likes to pretend that he is anything but. What I Think: Skippyjon Jones is such a funny cat! He is so full of imagination, he is almost overflowing. I think this book would be so much fun to read out loud with its singing and rhyming and Spanish thrown in. The illustrations are also as fun as the story with lots of color and movement throughout. I did feel a little iffy about the Spanish accent that was portrayed throughout- was it too stereotypical even if it is fun? I know kids will like it, but it was something that made me think. 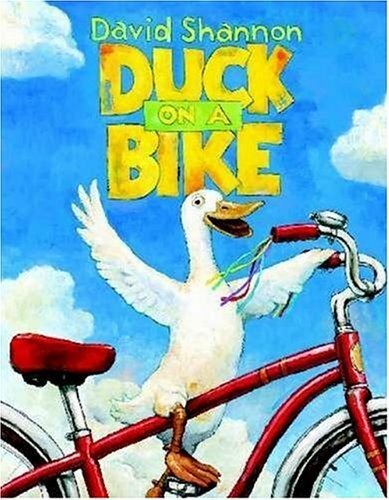 Summary: Duck wanted to ride a bike, so he did. At first all the animals thought it was a silly idea, but now everyone on the farm wants to ride a bike too! What I Think: This book would be a great read aloud in a preschool or kindergarten classroom to introduce different animals and their sounds. Each picture also showed a little bit about the animal's personality. It would be a blast to do each sound and voice. I can also see how children would find this book silly and would make them giggle. 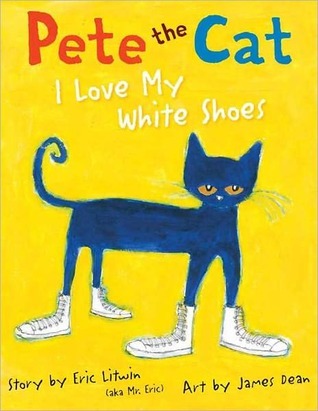 Summary: Pete loves his white shoes and will sing to you about them, but what happens if he steps in berries or mud? He just keeps singing, because it's all good! It is so funny that the second week in a row I chose 5/15 books and they just seem to work together so well. First, CATS! Pete and Skippyjon Jones, the cat on the farm and the tiger- it was a cats filled review. 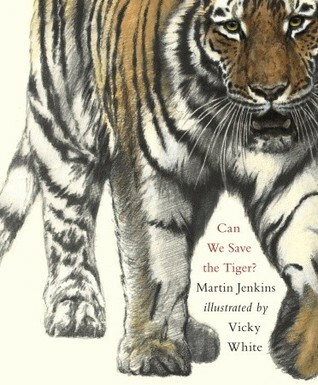 Now, poor Jacques don't fit in with the cats, but its focus on saving the environment fits with Can we Save the Tiger? Join me next week when I review the final 5 books including the controversial I Want my Hat Back. See you then!